Last few signed and numbered White Tara screen prints now available in A3 size (15.5 x 12 inches). The goddess Tara is the embodiment of mercy and compassion, and she is commonly venerated in her two main forms as Green Tara and White Tara, who according to legend both arose from the compassionate tears of Avalokiteshvara. In Tibet Green Tara and White Tara are identified with the two princesses that were betrothed to Tibet's first great Buddhist King, Songtsen Gampo, in the 7th century, where Green Tara is identified with Princess Bhrikuti from Nepal, and White Tara with Princess Kongjo from China. As the 'Savioress' Green Tara represents the active aspect of the goddess Tara who protects from the 'eight great fears', whereas White Tara is more closely associated with longevity and healing practices, and appears as one of the three main long-life deities of Vajrayana Buddhism. 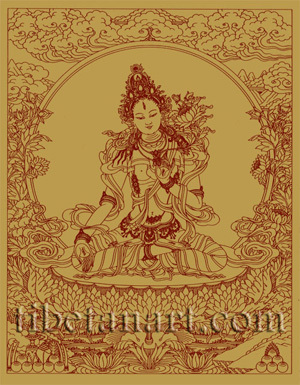 As 'Wish-fulfilling Wheel White Tara' she manifests as a yidam deity in her own right in the form described and depicted here. White Tara is beautiful and attractive, as youthful as a sixteen-year-old who is endowed with the thirty-two major and eighty minor marks of an enlightened being. She sits in vajra-posture upon a white moon disc and a white lotus with many petals that arises from the waters of a lotus-lake. She is radiant and white like the full moon of autumn, her complexion is as clear as a crystal gemstone, and her divine form radiates light of the five colours like the refracted rays of a moonstone. Her body is straight, her waist is slender, and the aureole disc of a full moon is behind her back, radiating cool beams of light to the ten directions. Her nature is that of Prajnaparamita, the mother of all Buddhas, and red Amitabha Buddha crowns her head. Her tiara is ornamented with open golden lotuses, upon which rest both worldly and divine jewels that radiate light. Her hair is the blue-black colour of sapphire and onyx, with the shimmering iridescence of bees. It is bound together at the back of her neck, with long curling braids hanging down over her right and left shoulders. She smiles sweetly, her lips are pure and red, she has forty neatly arranged teeth, and her tongue is slender and soft. The fragrance of lotuses is carried upon her breath. Her eyes are clear and long, deep black and white, with curving eyebrows, and long upward-curling eyelashes like the finest of cows. Her ear lobes are long and adorned with round earrings that are jeweled on their outer rims. She has seven 'eyes of awareness', three of which are in her face, and the other four are in the palms of her hands and the soles of her feet. Each of these eyes gazes outward with a compassionate smile. She is extremely passionate, with firm round breasts and a beauty that can undermine the stability of the three worlds. Her hands are like lotuses, with long slender and supple fingers, and her round neck has three gracefully curving folds. The three eyes on her face represent the purity of her body, speech and mind, and the four eyes in her palms and soles represent the 'four immeasurables' of her boundless compassion, loving kindness, sympathetic joy, and perfect equanimity. She wears three necklaces adorned with white pearls; one hangs around her throat as a choker, one hangs above her breasts with a jeweled pendant, and one is long and curves beneath her navel. Her bracelets, armlets and anklets are of the same design, and identical except for their size. Around her waist is a golden belt with strings of pearls, flowers, gems, and little silver bells hanging from it. All of her eight precious ornaments are adorned with all manner of jewels, especially white pearls. She wears an upper garment or bodice of embroidered white silk, and lower garments of rainbow-coloured silks. A long silk scarf curves about her shoulders and arms, with its ends billowing outward at her sides. Her right hand rests upon her knee with its fingers extended in the boon-granting varada-mudra of supreme generosity. Her left hand is held at the level of her heart in the abhaya-mudra of giving refuge, with the tips of her thumb and third finger touching to form a circle while her other three fingers extended upward. The stem of an immaculate white utpala lotus is held between the tips of her thumb and third finger, which blossoms beside her left ear. This lotus branches into three stems, one bearing the main blossom, and the other two bearing a bud and a seedpod with discarded petals, which collectively represent the Buddhas of the Three Times - past present and future. Her aura is encircled with lotus flowers, while clouds billow over the mountains in the sky above. In the lower corners of this drawing are offerings of jewels, elephant tusks, a conch shell and a branch of red coral.